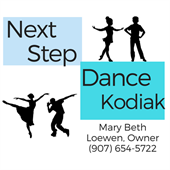 Welcome to Next Step Dance Kodiak ! We are excited to offer a welcoming atmosphere for people of all ages and backgrounds. We offer classes for ages 3-adult: rhythm&movement, ballet, tap, jazz, hip hop, contemporary, tumbling, ballroom, adult ballet, hip hop and tap, barre class and yoga! If this is your first time here, you'll need to sign up for an account, add a payment option, and fill out some basic information about your student or yourself. Please click on the Search button below, then choose the class. Make sure the location is set to "all" in your search fields. I understand and recognize the risk of physical injury inherent in dance and dance performances and I am willing to assume those risks. I agree that I will not hold Next Step Dance Kodiak, its directors or employees liable for injuries sustained while in attendance and/or participating in any dance activity at Next Step Dance or any activity involving Next Step Dance i.e. recital dress rehearsals, recital performances, and community performances. I understand tuition for classes is billed on the 1st of each month, and it is my responsibility to ensure my billing information is up to date and correct. I further understand that if tuition has not been paid within 30 days of due date, I or my child may not be allowed to participate in classes, recitals, and other studio activities. I understand that all costume fees must be paid in full before receiving costume items. Refunds may be given only in the event of a serious injury or illness which prevents completion of the class. Missed classes due to personal schedules or sickness are eligible for make up class. I understand that photos of myself and/or my child(ren) taken in dance class, dance camp, picture day and/or performances may be used in promotional advertising including printed brochures, newspaper advertisements, social media such as Facebook, Instagram and the Next Step Dance, Kodiak's, website. We do our best at all times to maintain the privacy and and online integrity of our students and their families. If you prefer your child not to appear in photos or video which may be posted online or in printed materials, please include a note during registration and we will do our best to ensure media featuring that child is not used outside our studio. However, photos and video may still be taken during class, and used for various purposes throughout the year by Next Step Dance Kodiak.